While doing some research for my upcoming sermon on the structure of the local church I came across an interesting quote. This comes out of ” The Story of American Methodism” by Frederick Norwood. It was one of my required readings in Divinity School that hadn’t been cracked much then or now. What caught me was the young part. 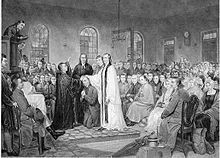 Some 229 years ago, at the first General Conference many of the clergy there were young. As I head to Annual Conference next week I, no longer a young clergy at the age of 36, will not see many younger than I. The young are dwindling but that is not any new news. Moreover, what I will probably see less of are the number of disinterested clergy and laity for that matter. Disinterested is defined as “not influenced by considerations of personal advantage.” In my 13 trips to Annual Conference I have noticed that personal advantage is something sought after and craved by both laity and clergy. Whether it is in the conversations over appointments or petitions or even the budget the bottom line that comes up is “what is in it for me.” Now when I say me I mean, “my church”, “my denomination”, “my conference.” It is tossed around like the focus of why we are here has more to do about the individual than it does the in-breaking of the Kingdom of God in this world. I wonder what it would be like to go back to the first conference, that Christmas Conference in 1784 as a new denomination was born. I bet I would find young clergy eager to do something that would make a difference for the sake of the Kingdom of God in this ‘new world’. I pray I can have that kind of attitude towards the ‘new world’ that surrounds me everyday.